As we throttled down on Mosquito Lagoon the sun and the wind were perfect. The sky being clear gave us the best vision for sightcasting. I hopped on the tower and started poling my customers. We hadn‘t gone fifty yards when the first hidden Red scittered out of sight, always a good sign. Throwing a top water and an old standby, a shrimp, we poled slowly, fishing the white holes and grassy flats. 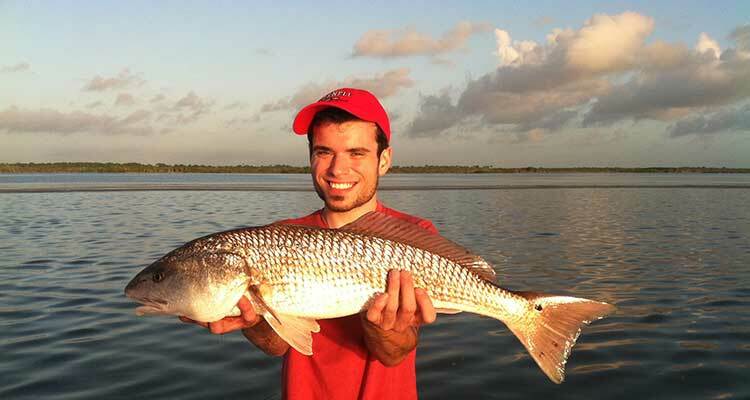 This type of fishing is the most fun and challenging way to catch Redfish and Trout. We caught several nice fish, some on top and some on shrimp, almost always seeing the take. Breathtaking. I’ve seen a school of Redfish not eat anything we had live, dead or fake. It’s very frustrating, watching a big Red nuzzle a live mullet. After a couple of hours that school moved on. Five minutes later another school popped up and they ate everything. That’s what keeps it interesting and keeps me coming back. 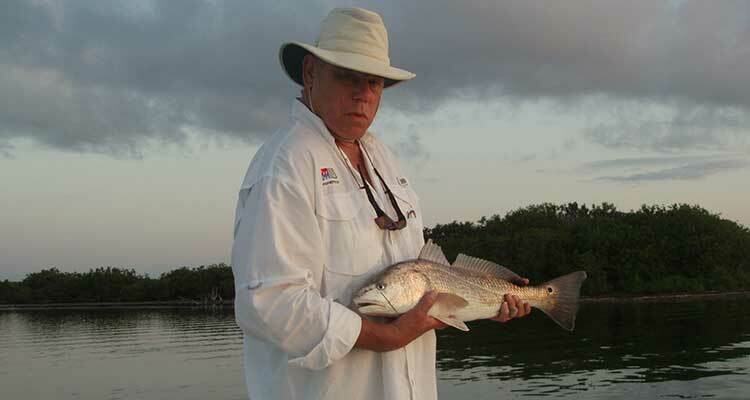 Stalking Reds in Mosquito Lagoon has become a lifelong passion for Capt. Karty Sills. 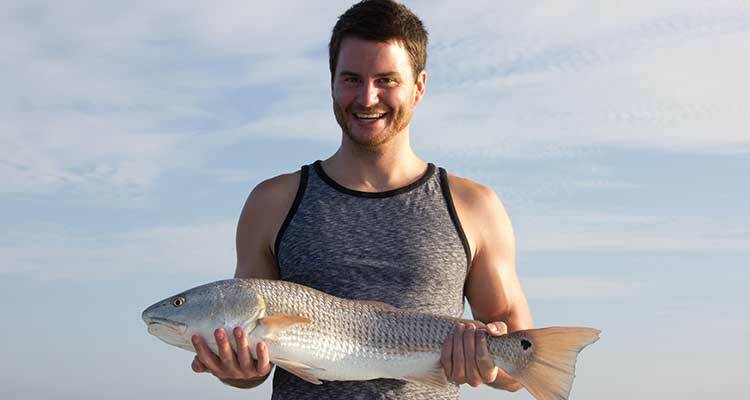 His instinct and knowledge gained from years of experience lead him to an area perfectly suited for a school of redfish hungry for crabs, shrimp, and small fish. He scans the water for the telltale signs of Redfish tails. They are feeding, so involved they don’t notice his presence. Sciaenops ocellatus, Redfish, Red Drum, Channel Bass, Spottail Bass. Reds are the only species in the genus Sciaenops. Redfish are game fish found in the Atlantic from Massachusetts to Florida and in the Gulf of Mexico from Florida to Northern Mexico. Redfish are often found in areas with sandy mud bottoms in coastal waters and estuaries, like Mosquito Lagoon on the east central coast of Florida. Three year-olds generally weigh between six and eight pounds. 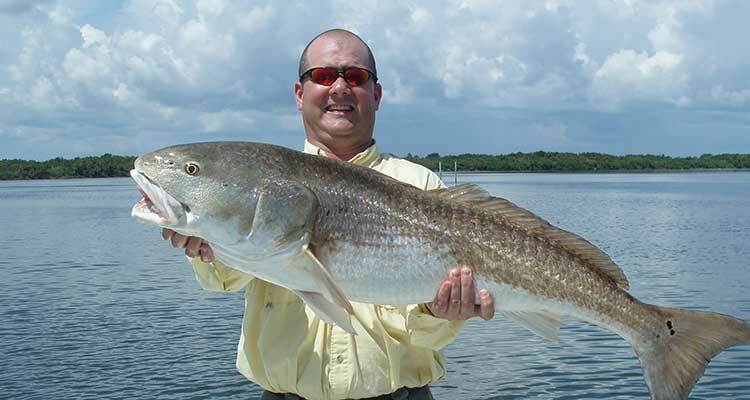 The largest Redfish on record weighed over 94 pounds. Large ones are called Bull Reds. It is said that the Bull Reds are not good to eat. They are usually photographed and released. 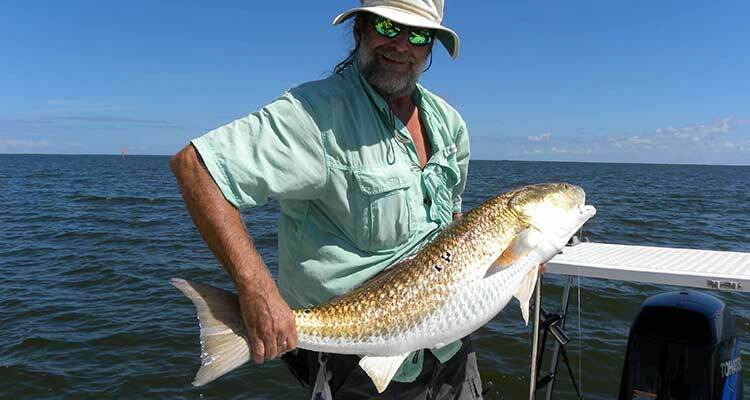 Redfish spawn near shorelines from mid-August to mid-October. The eggs will incubate for twenty-four hours. A female Redfish can lay up to two million eggs in one season. Juveniles are known to inhabit bays and coastal marshes until they reach maturity at three to six years of age. Redfish can live sixty years. I have enjoyed my trips with you. You make everyone feel comfortable and make the day enjoyable. Randy is a pro bass fisherman and he can't stop talking about all the fun he had on that trip! He thinks its a real big deal that he caught a RED FISH and a TROUT!!! I can't thank you and Karty for all the fun! WE WILL BE BACK!! I grew up in this area fishing, crabbing and clamming almost every weekend of my childhood. The trip I had with Karty is one of the most memorable fishing trips I've ever been on in the River Lagoon!! He knows those waters and those fish! Thanks again! The Redfish has one large black spot on the upper part of the tail base. It is not uncommon for Reds to have multiple spots. 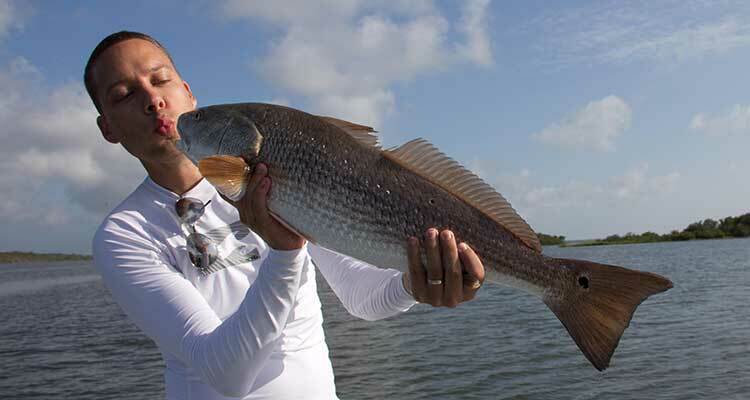 It is extremely rare to find a Redfish with no spots. The black spot near the tail may help fool predators into attacking the Red Drum’s tail, aiding its escape. Redfish are related to the Black Drum, Pogonias cromis, and are often found together. They can interbreed and both make a croaking sound when they perceive trouble.